First off, after yesterday's little red flying saucers story let me assure this isn't a map about little green men. In this case MARTIAN stands for MARs Tools for Interactive ANalysis. So whilst it isn't a map about little green men it is a map about everyone's favourite red planet. MARTIAN uses the Google Maps API to create a topographical map of Mars. 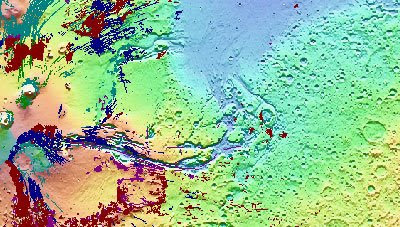 The map includes crustal thickness and Moho topography views. It is also possible to view normal faults and stress solutions. MARTIAN also includes a number of links to locations on Mars. Clicking on one of the links will centre and zoom the map on that location. Modified Mars - a Google Map of Mars showing the planet in 2208 after it has been terraformed. Star Viewer - A map that geotags Hubblecast videos on a map of the night sky. HeyWhat'sThat Cosmic Visibility - generates a horizon view of the night sky for any given location. Hertszptung-Russell Diagram - an interactive Hertszprung Russell Diagram map of 3000 nearby stars. India Google Maps Mashup Roundup!